Here’s a delicious twist on the world famous Caprese Salad. Stack it up with grilled zucchini as one of the layers. This is a terrific presentation for entertaining. The stacks look great and make a wonderful individual appetizer or light main dish. 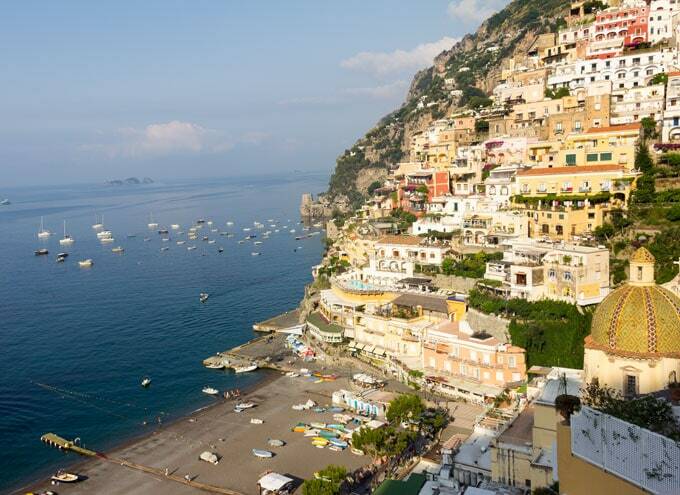 Ciao from Positano, Italy! I’m here with my husband Eddie. 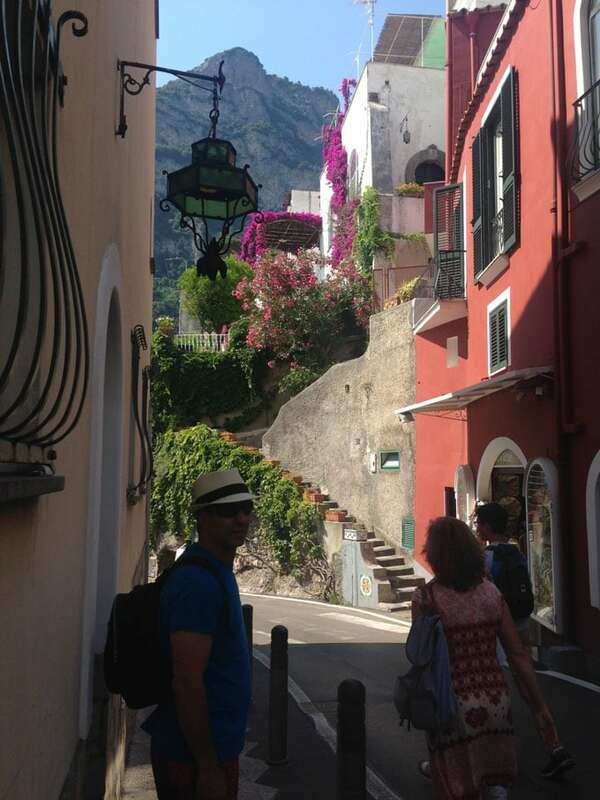 We’ve been meaning to come here, to the Amalfi Coast, since we got married 25 years ago. It was supposed to be our honeymoon destination. But we had just bought a new house that needed a ton of work, so we cancelled the trip to Italy and spent two romantic weeks in Connecticut, wall-papering and painting. I’m not being sarcastic – it was a great honeymoon….definitely nothing like Amalfi, but there was something romantic about working on our house together and watching it slowly transform. And every night after work we treated ourselves to fabulous dinners at the best restaurants in the area, rationalizing that no amount of food or fine wine could come close to what we would have spent on a trip to Italy. I’m not sure why it took us 25 years to get here – we’ve been pretty busy with kids and work I guess – but anyway I’m happy that we finally made it! The beauty of the landscape here is surreal. The towns are built into the cliffs and tower above the beautiful sea. Everywhere you look dramatic stairways lead up to houses and shops, and down to the beach. 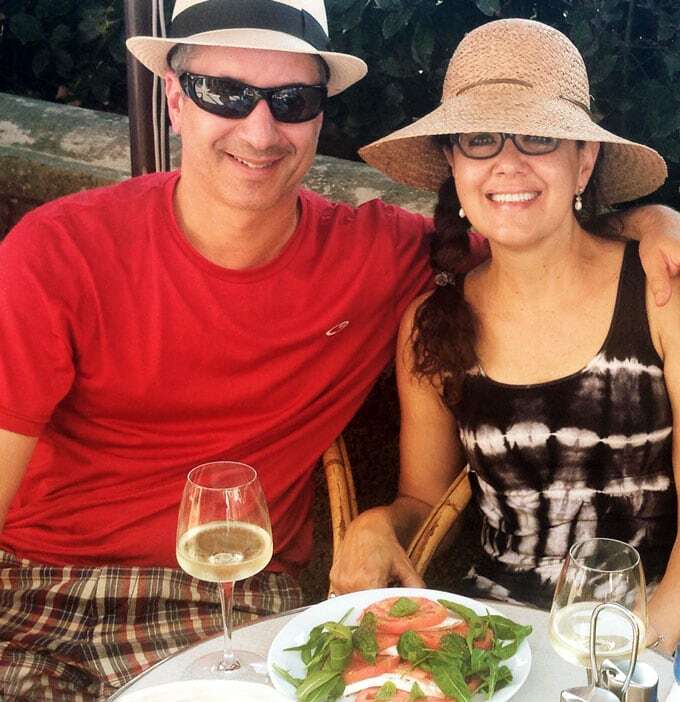 The other day we took a boat to the nearby Isle of Capri – home of the Caprese salad. Of course we ordered one for lunch. 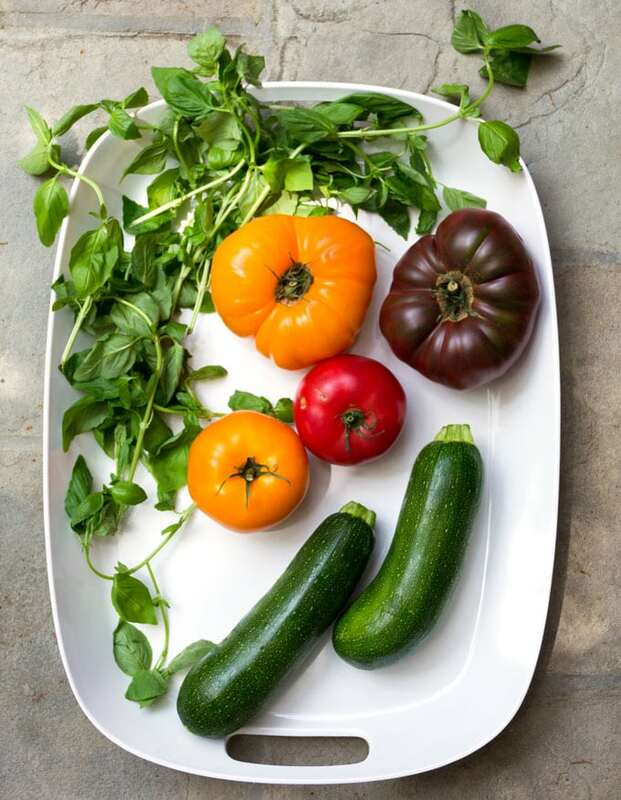 It was simple and delicious – ripe tomatoes, mozzarella, basil and arugula leaves, and a drizzle of olive oil. There are certain excellent dishes for which the chef can’t take much credit. All the praise goes to the ingredients. Caprese salad is that kind of dish. Ripe juicy tomatoes, tender creamy mozzarella cheese and fresh basil leaves. Put them together with a splash of olive oil and a sprinkle of salt and pepper, and you have one of the world’s most delicious salads. 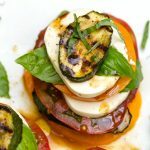 I love this festive variation of a Caprese salad, piled into stacks, with the addition of grilled zucchini and a light balsamic dressing. It’s definitely a departure from the traditional version, but a delicious one! Use the freshest, ripest, and best quality ingredients you can find, and enjoy! 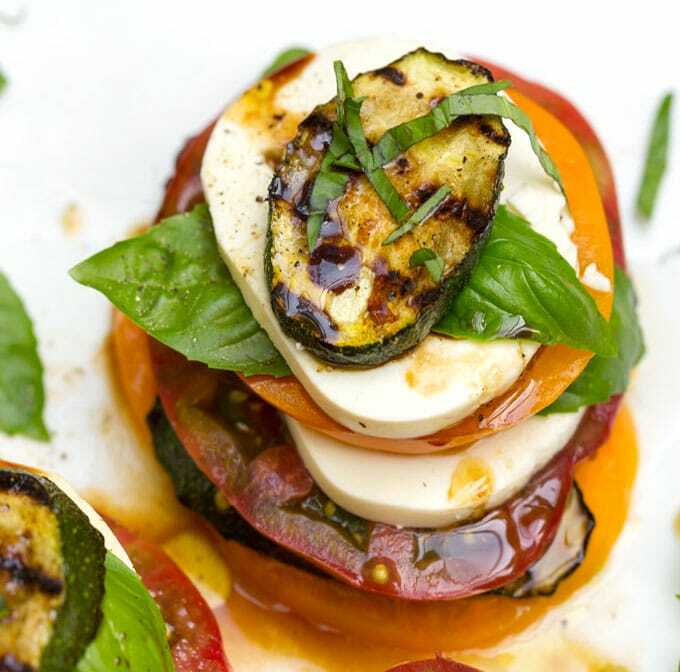 Here’s the recipe for Grilled Zucchini Caprese Salad Stacks. If you make them, please let me know what you think. 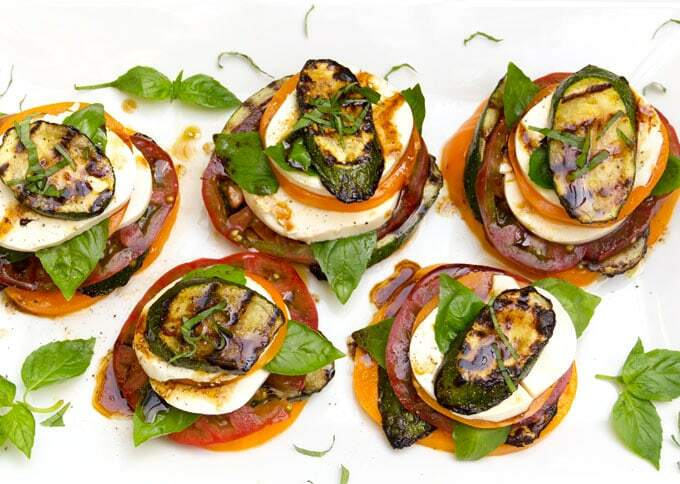 A delicious stacked salad of fresh mozzarella, tomatoes, basil and zucchini. Grill the Zucchini: Preheat grill to medium-high heat. Coat both sides of zucchini with cooking spray or brush lightly with oil. Sprinkle with 1/4 teaspoon salt and several grinds of pepper. Arrange on grill; grill 4 minutes on each side. Set aside. Make Dressing: In a small bowl, whisk oil, balsamic, garlic, 1/4 teaspoon salt, 1/4 teaspoon pepper. Set aside. Assemble the Stacks: Drizzle a bit of olive oil and a sprinkle of salt and pepper on a platter or on individual plates. Arrange the 5 largest tomato slices on top. Top each tomato with 2 zucchini slices, then another (slightly smaller) tomato slice, then 1 cheese slice. top with another tomato slice, one final cheese slice and a zucchini slice at the top. Gently tuck basil leaves in all around the stacks, between layers. 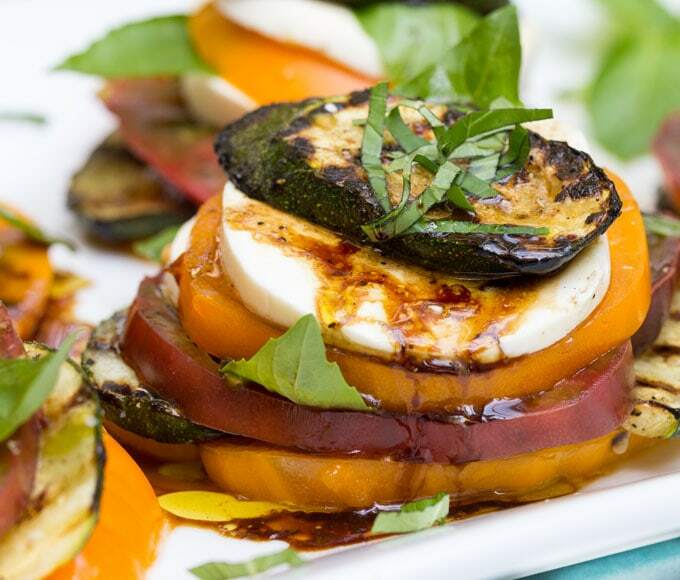 Drizzle balsamic dressing evenly over stacks; sprinkle with the slivered basil. Season with salt and pepper, to taste. I am wildly envious. Love the Zucchini recipe. Have a FAB time. See my comment is short and sweet too. My favorite salad ever. Simple and delicious and perfect. Love the zucchini addition. And thanks for the pictures of Italy. Living vicariously!!! Beautiful! What a great take on this classic salad – it is the depths of winter here – good tomatoes like these are but a distant memory. But will tuck this away because it is also a great use of zucchini. Beautiful!!! Love your honeymoon story. Surely, you appreciate this trip more now than you would have 25 years ago! !